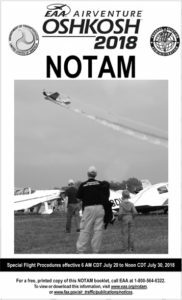 Click here or on the image to view or download 2018 AirVenture Oshkosh Notice to Airmen (NOTAM). The following information (emphasis added) is taken from the official NOTAM available at the above link. If you are flying a Vintage qualified aircraft (December 17, 1903 through December 31, 1970) you are eligible to park and/or camp in the Vintage Showplane area. We do not have the space to make any exceptions. Once you have been separated from other aircraft types and taxi to the Vintage area, please keep the sign in your windshield to assist the Vintage Flightline volunteers in directing you to the proper location within the Vintage area. If you are flying a returning Past Grand Champion, or have pre-paid and staked your camping spot, when you reach the Vintage area it is helpful to have an additional sign for our parking crew. If you have a pre-paid spot, please indicate Row and Slot, and if it is west of Wittman Road, add a W.
Your sign will be mailed to you. All aircraft at AirVenture must be properly tied down. Here are two great articles on tying down your aircraft. PLEASE NOTE: We may be updating this page prior to AirVenture with additional information as necessary. Check back often.